There’s irony in the trajectory of Philip Guston’s long and distinguished career as a painter. As a boy, he drew cartoons, perhaps in part as an escape from a series of overwhelming family tragedies. (It was Guston who found his father hanging from a rope, a suicide. His brother Nat was killed in an accident in which his legs were crushed.) Guston’s mother encouraged him, enrolling him in a correspondence course from the Cleveland School of Cartooning. Although he didn’t stick with the course, his interest in cartooning continued; he even won a Los Angeles Times contest. The current retrospective of Guston’s work amply demonstrates that he was a gifted draftsman. His early works, influenced by his assiduous study of the old masters, by his exposure to the Mexican muralists, and by Picasso and de Chirico, are diverse–the young artist exploring, seeking his own style–but strong by any measure. In tune with the direction of his contemporaries (he went to high school with Pollock), Guston moved from figuration to abstraction in the 1950s and 60s, producing work that was highly respected, canvases often of great beauty. But Guston’s abstractions offer neither the energy and verve of Pollock nor the more challenging deconstructions of DeKooning. Then, in one of those landmark exhibitions that mark seismic shifts in the art world,Guston abandoned the by then holy grail of abstract expressionism and returned to (utterly unfashionable) figuration in a 1970 show at the Marlborough Gallery in New York. It caught people off guard, challenged the status quo, and elicited a damning review in the New York Times. 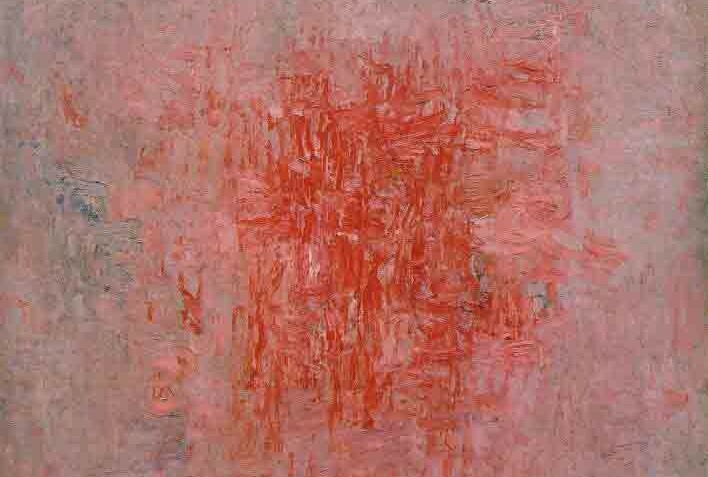 "It was as though I had left the Church; I was excommunicated for a while," Guston was quoted. But as seen in this retrospective of the artist’s career, the work from 1970 on is more idiosyncratic, more expressive, more affecting and more memorable than the earlier, successful abstractions. Guston let flow his figurative skills in canvases that drew unequivocally on his cartooning experience and that utilize imagery that reflects what seem to be his personal demons. Themes from his early work reappear–hooded figures (the Ku Klux Klan was active in the Los Angeles of Guston’s youth), garbage can lids as shields. Almost obsessively repeated images of shoes and disembodied legs perhaps derive in part from his brother’s accident. Cigars, pointing fingers, and clocks appear regularly, as well as imagery of rising floods. The influences of his early exposure to the comics of George Herriman and the later work of Robert Crumb are evident in these later works, as is Guston’s interest in the painting of Max Beckmann. In the later 1970s, the work grows darker, weightier, more architectural. Guston’s political views are never far from the surface; the 1975 San Clemente is a caustic caricature of Richard Nixon. The politics mostly give way to a more personal sense of profound unease–the painter with face half-hidden behind a wall, the painter trapped in a spider web, the painter and wife huddled under the bedcovers, the painter engulfed by rising waters. The acceptance of Guston’s later work is surely, in part, a result of the return to favor of figurative art in recent years. As well, perhaps, it’s an an indication of some shift of attitude in the art establishment. Cartoonists have generally been ranked somewhere beneath serious consideration in that world and to label a work cartoon-like has been to damn it to unworthiness. In a fine essay in the catalogue for this retrospective, Bill Berkson elaborates on the influence of graphic art on important American painters. He writes: "’High’ and ‘low’ persist as fuzzy terms for gauging aesthetic hierarchy; over time they come out in the wash, like lint."